Enniscorthy Castle is situated in the historic town of Enniscorthy, Co. Wexford. The first construction on the site was undertaken over 800 years ago and the castle has played an important part in the development of the town of Enniscorthy, having witnessed many battles, sieges and even a visit by Cromwell’s forces in 1649. Originally home to the Anglo-Norman de Prendergast family, ownership of the castle has changed hands many times and has included the MacMurrough Kavanagh clan, Sir Henry Wallop and the Earl of Portsmouth. The Roche family were the last to live there, departing in 1951. Over the years, the castle has had a truly spectacular history and has been ruined a number of times, served as a prison during the 1798 rebellion, was used as billet accomodation for extra police drafted in during the Fenian Rising, served as a prison in the early 1900’s, was occupied by the Irish Volunteers during the 1916 Easter Rising, was commandeered by the Free State Army during the Irish Civil War and more recently became a museum. 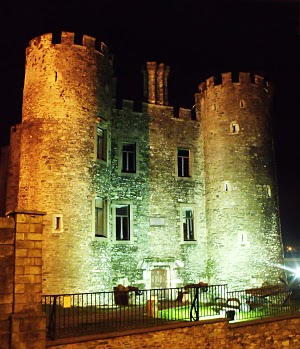 Wexford Paranormal first visited the castle in early 2011 and have returned many times since then. In 2012, paranormal investigation teams from around Ireland also started to visit Enniscorthy Castle. On one of our very first visits to Enniscorthy Castle, We were joined by a journalist who was doing a piece on the group and a press photographer. We received some ITC responses and since then we have had numerous further contacts from ‘Jim’ who revealed such information as his firstname, surname, his wife and son’s names and following up on this information we were able to locate them in the census of 1901, including where they lived in the area at the time. Further research showed us that he still has family living in the area and as such we have taken the decision to not release his surname. We are currently carrying our further research into ‘Jim’ and his family based on the information we have been given. The recording of our initial contact with ‘Jim’ is available in the EVP section of our website. On behalf of the team i would like to thank Michael for a brilliant night @ Enniscorthy Castle, and was a pleasure to be there. Nice to meet the rest of Wexford Paranormal Team as well. I know some of us will DEFINITELY be back……. Cracker of a night in enniscorty castle 🙂 wel done guys 🙂 cant wait 4 round 2! Just in bed after a totes amazing night with wex paranormal in enniscorthy castle!!! It was a truly amazing weekend at the Castle and I can not settle one bit now I am home. The house ghost is usually a harmless and well-meaning creature. It is put up with as long as possible. It brings good luck to those who live with it.